"Have a window that is foggy or has moisture?" Don't replace the whole window, we can replace just the glass for a lot less money. Whether you have an insulated glass window unit to be replaced or just simply a piece of window glass, we can replace it for you. We can also make new screen and storm window panels or rescreen or replace the glass in your existing storm windows. 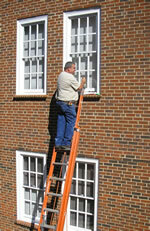 Contact us at (336) 841-5333 concerning any glass replacement services that you require. Our our experienced glazing specialists are here to assist you in every way possible.